Bruegel fellows Alicia García-Herrero and Uri Dadush join me for this Director’s Cut of ‘The Sound of Economics’, focusing on the progress made by China’s Belt and Road Initiative, how it will continue to develop, and the reactions it has stirred across the world. China’s Belt and Road Initiative (BRI) is a trade and development strategy proposed by Xi Jinping in 2013. It aims to enhance development prospects via infrastructure, trade, and investment on a trans-continental scale, and is hence often referred to as ‘the 21st century’s Silk Road’. Five years after its launch, how well has the BRI been received and how much potential does it still hold? 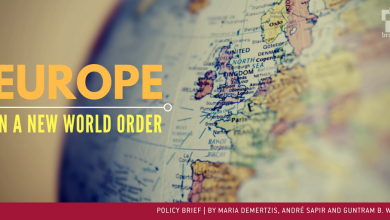 Two Bruegel scholars, Alicia García-Herrero and Uri Dadush sit down with me to discuss their analyses of the initiative. In a recent Policy Contribution, Uri Dadush and Michael Baltensperger reflect on the background and context of the BRI, and critically assess the project’s potential for future performance. In this podcast episode, Uri points to the worrisome aspects of the initiative, particularly the lack of transparency and due diligence concerning the issue of debt trap, as well as China’s poor regard for the possible environmental impact. In a newly released Working Paper, Alicia García-Herrero and Jianwei Xu analyse large amounts of data to identify the trends in the global perception of the BRI. In this episode Alicia lets us in on their findings. For example, she explains why – despite the generally positive image of the initiative – it is the Central European countries, which benefited from substantial assistance from China, that have a relatively negative perception of the initiative. For further reading, you may consider Simone Tagliapietra and Shivali Pandya’s blog post on Chinese investment in European maritime ports, as well as a piece by Alicia García-Herrero and Jianwei Xu discussing what the Belt and Road Initiative means for EU trade.